Photo by Nanci O. Taken February 18, 2013 at The Freedom Expression Tunnel in Raleigh, NC. Imagine if there’s somewhere budding lyricists could speak rhymes (new or written), without judgement, to better sharpen their rap skills. A training ground for rappers, a place to "shoot in the gym." What if there was a place where seasoned emcees could go for inspiration? What would it look like if there’s a spot where poets are welcome, collaboration breeds excitement and people come to soak it all in? A place that cannot be located by GPS. All for the love of hip hop? There exists such a spot. In the heart of North Carolina (Raleigh, the capital city) at The Freedom Expression Tunnel on North Carolina State University’s campus. 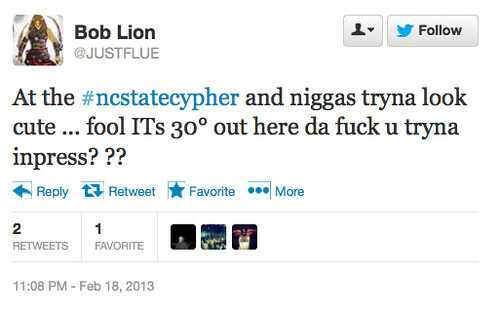 It’s known as the NC State Cypher (#NCStateCypher). 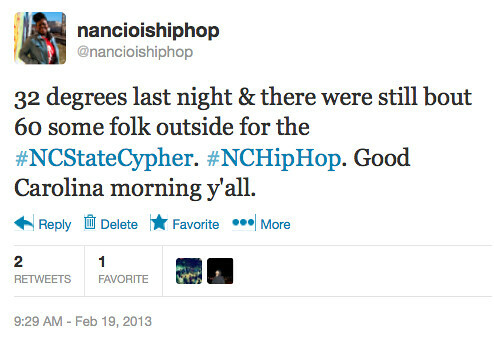 I’d been hearing about the #NCStateCypher for a minute, at least a year. 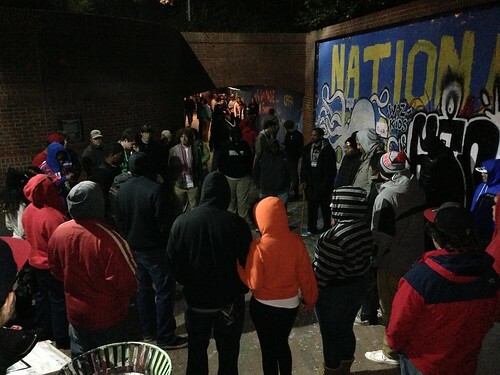 Every Monday night beginning around 11pm/11:30pmish a crowd gathers on NC State’s campus at The Freedom Expression Tunnel for the cypher. The Freedom Expression Tunnel is just that. Anyone can show up to express artistic creativity, the most obvious form being graffiti. See: A collection of art created on the walls, floor and ceiling of The Freedom Expression Tunnel. I ran into Jrusalam, the #NCStateCypher’s current promoter, at a show back in January and he invited me to come check things out. Before going though, I wanted a chance to really learn what’s it about (besides what I’d heard) so we chatted about that and much more. 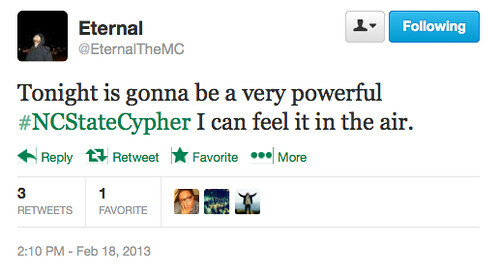 Almost three years ago Raleigh, NC’s Mic Live had the idea to begin the #NCStateCypher. According to Jru, the first gathering was a video and album cover photo shoot for God Cypher Devine, a group consisting of Mic Live and the 1100 Hunters. From that point, Mic Live decided to keep it going, always on a Monday night. The gathering really took off when then local photographer Khali Rhe (who lives in Lousiana now) and her partner Darryl came out one evening, took photos, captured video and posted them on Facebook. Since that point in time, the rest is North Carolina hip hop history. 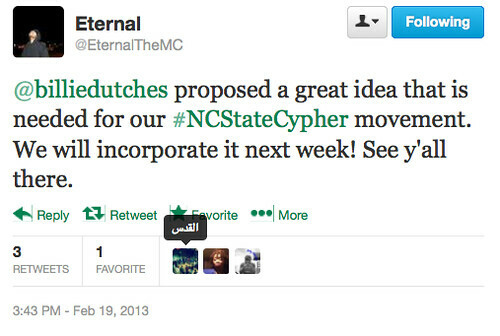 The #NCStateCypher is becoming known as a "training ground" for emcees. There is no where else a rapper can go to work on delivery and performance skills, in a judgement free zone, receive immediate feedback and/or constructive criticism. YouTube videos do not apply here. Some folk may blow off the #NCStateCypher as just amateur night, but if we’re now a master of a craft then that means we, at some point, was an amateur. And how do amateur’s become masters? Like Allen Iverson said, "We ain’t talking about the game. We’re talking about practice!" So Monday night February 18 I bundled up and headed out. I GPS’ed the location and Google gave directions that weren’t legit. I ended up lost. Driving around in circles lost. Ironically, beforehand I’d hit up a comrade and said if I get lost I’ll call you, LOL. One phone call later and we were on our way. It was a cold Carolina night but surprisingly there was still a crowd waiting for the #NCStateCypher to begin. The night commenced with someone enthusiastically welcoming everyone to the #NCStateCypher — I think it was Tucson of the 1100 Hunters but not sure. As the #NCStateCypher continued, I realized that most of the people there were observers. Out of about 60 or so people, less than 10 of those were actual emcees. Dasan Ahanu, our local griot, was the lone poet to join in the cypher. Everybody else watched, gave the rhymers feedback and enjoyed the art of lyricism. There were also several graffiti artists who were painting the mural you see in the photo at the beginning of the post. Overall it was a great night, with high energy, witty punchlines, great lyricism and innovative moments. It’s clear that some of the emcees are still learning the art of rap, but it’s cool because that’s a part of the process of moving from amateur to expert. Remember, this is a judgement free zone. Folks take part in the #NCStateCypher as an opportunity to become better. As I drove home it dawned on me the importance of the #NCStateCypher. It’s been three years since it began and is still going strong. In RDU (Raleigh-Durham-Chapel Hill), typically an event will occur a couple of times and then fade away. Over the past year alone several of the smaller venues where hip hop is performed have closed down. I believe one reason is because there’s nothing else like it in the state of North Carolina. The fact that the #NCStateCypher takes place in the heart of the state is kind of poetic too. Also, the weekly gathering gives anyone an opportunity to express themselves creatively. You don’t have to be a rapper. Poets, graffiti artists, break dancers and all elements of hip hop are welcome. The #NCStateCypher keeps the spirit of North Carolina hip hop alive by proving, yes there are people here who care about the culture. A running joke in the industry is that North Carolina does not have a hip hop scene. Well clearly there is one. Perhaps our take on the culture, how we experience and express it is just different from say, an Atlanta, Houston or the DMV. If you’re ever in Raleigh, NC on a Monday night drop by The Freedom Expression Tunnel and take advantage of the opportunity to participate in or observe an important piece of North Carolina hip hop culture and history. If you’ve ever been to the #NCStateCypher, why do you think it has lasted so long? What are some of your favorite things about the gathering? I’d love to hear your thoughts. Post them below and/or add it to the #NCStateCypher hashtag on Twitter. This entry was posted in Commentary, Events, Freestyle, The Local Buzz and tagged #NCStateCypher, NC Hip Hop, The Freedom Expression Tunnel. Bookmark the permalink.